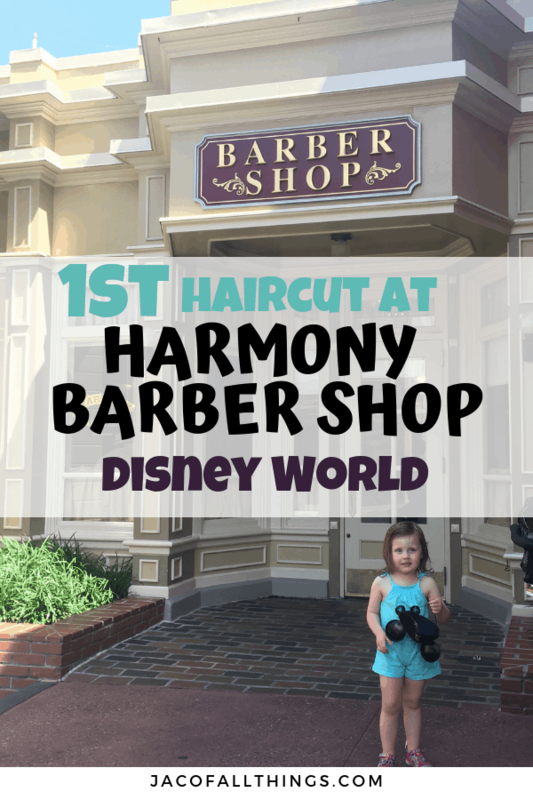 If you are looking for a magical experience at Disney World, you need to check out Harmony Barber Shop. Harmony Barber Shop offers haircuts for children and adults with a charming old-fashion feel. 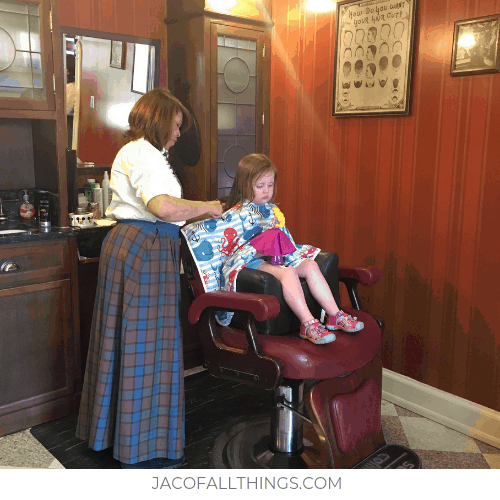 Like everything else at Disney World, magic is in the air at Harmony Barber Shop. You will have an unforgettable experience. Where can you find Harmony Barber Shop? How much does a haircut cost at Harmony Barber Shop? 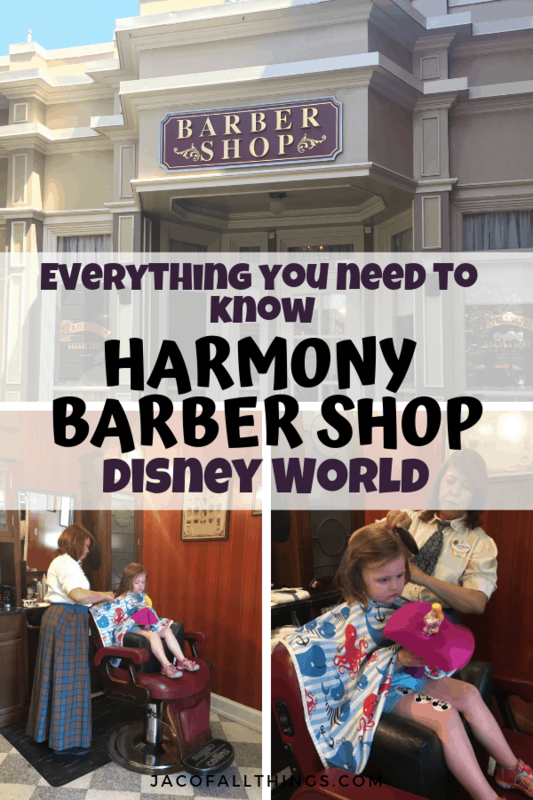 Harmony Barber Shop can be found right in the Town Square on Main Street at Magic Kingdom, Disney World. After entering the park, and going under the railroad tracks, you will be in the Town Square. Harmony Barber Shop is located to the left of the flag pole tucked in the corner. Tips are not included in the above prices so be sure to bring a few extra dollars in CASH! Harmony Barber Shop is open everyday from 9:00 am – 5:30 pm. As a reminder, the barber shop is located INSIDE Magic Kingdom park, so you will need a valid park ticket to enter. 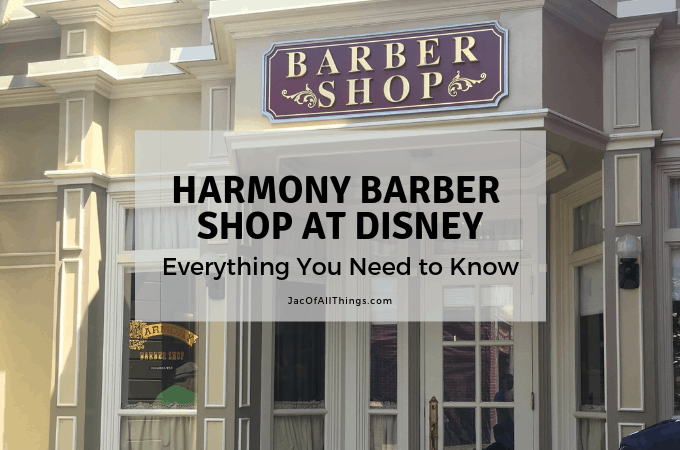 Disney World is notorious for making your experience at their parks magical, so it makes sense that the Harmony Barber Shop would be no exception. What’s more magical than a little bit of Pixie Dust? After your hair is cut, you have the option to add Pixie Dust (aka hair glitter) to your hair. Insider Tip: If the barbershop is not swamped, ANYONE can ask for a coating of Pixie Dust! Even if you are not getting your haircut! If you are lucky, you can time a haircut with a performance by the Dapper Dans. This four-man group serenades guests with a cappella hits like “Yankee Doodle Dandy”, “Zip-a-Dee Doo Dah”, and other classics. 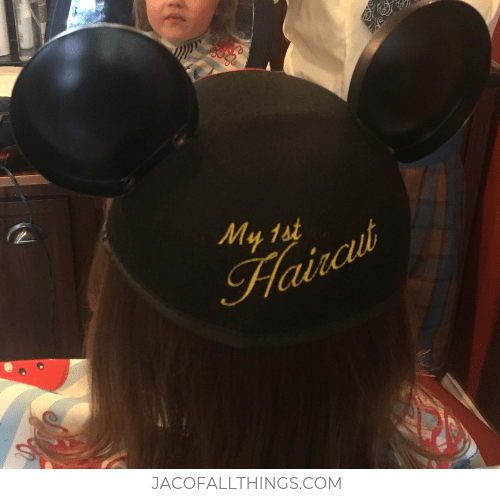 Getting your child’s first haircut at Disney World is a magical experience. You can read more below about my daughter’s first haircut. In addition to getting your child’s haircut, you get Mickey ears with “First Haircut” embroidered on to always remember. You will also receive a small clip of hair from their first cut to keep as a momentum and a special certificate for “bravery and cheerfully submitting to our clippers and shears”. When I was 6 years old, my younger brother and sister got their first haircuts at Disney World. When we came back home, they decided to “play Disney” and further chopped off their hair. You can imagine how thrilled my parents were. 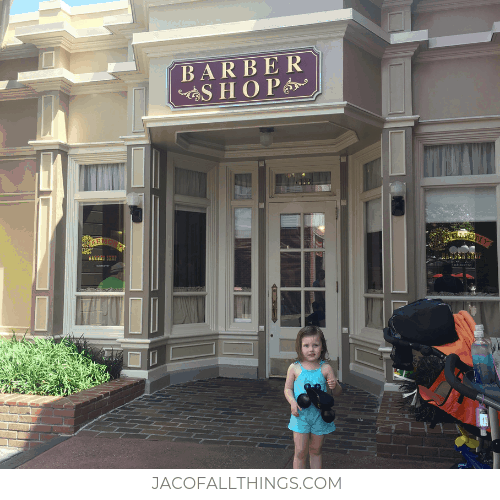 When we walked past Harmony Barber Shop on our first day in Magic Kingdom, I instantly knew it was the perfect place to get my daughter her first haircut. After all, it was practically a family tradition. 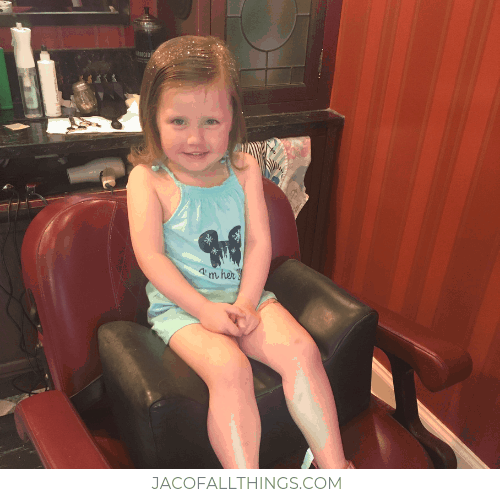 She was three at the time, but given that she was practically bald for the first two years of her life, she didn’t have much hair! Making reservations was easy. We called first thing in the morning and were able to book a haircut for the same day, just a few hours later. The barbers at Harmony Barber Shop were just perfect with my daughter. They gave her a fun bubble wand to play with and asked her questions about her favorite rides and characters. They sprayed her hair with a small amount of water and gave her a nice trim. After her cut, she was dusted with magical Pixie Dust (aka hair glitter). 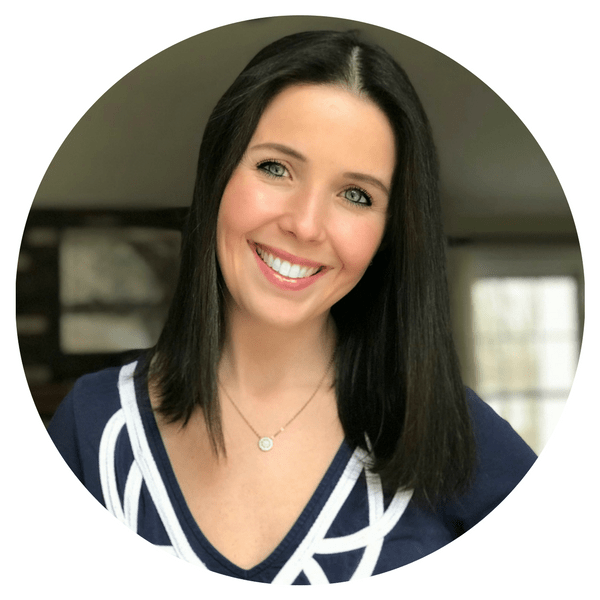 The entire experience took about 10 – 15 minutes. While we were waiting, a Disney PhotoPass photographer was in the barber shop taking pictures of those getting cuts. We just missed them, but were able to take plenty of pictures ourselves. The only thing that would have been better is if we were able to time her haircut out with one of the performances by the barbershop quartet! Access Your Disney World Budget Worksheet Now! Use this Disney World budget worksheet for planning a magical trip! This workbook can be customized to your trip to find out how much your Disney vacation will cost. Buy now for only $4.99!